How to resolve one-way or no-way audio problem? In previous blog, we have discussed why there is one-way audio problem. In this blog, we will continue our discussion to find how to resolve this problem. 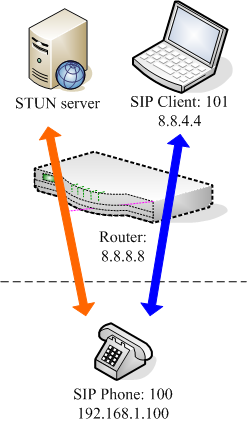 As we can see, the SIP phone (100) sends its private address to SIP client (101) and this makes the one-way problem, so we can think why not send its public address which is 8.8.8.8 to the SIP client? If it can do that, SIP client can send its audio stream to this public address and the router will transfer it to the SIP phone, then SIP phone can hear SIP client, right? Right! It is a perfect solution. But we need ask: how can the SIP phone (100) know its public address? The answer is STUN. 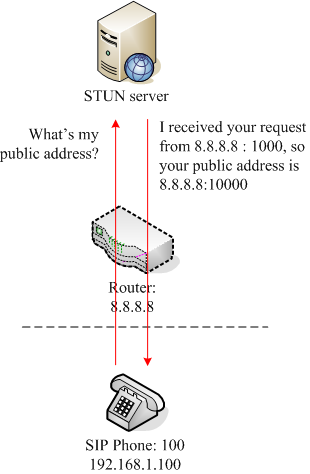 STUN means “Simple Traversal of User Datagram Protocol (UDP) through Network Address Translators (NATs)”. It is a very long definition. Simplely, STUN is a tool to discover public address for devices deployed in a private network. Before SIP phone makes a call, it asks STUN server firstly to get its public address. After that, in our previous scenario, when SIP phone begins to make a call, it can say: Hi, I am 100, my audio address is 8.8.8.8:10000. Please send audio stream to me. By the way, here one public address means one public IP address plus one port. For example, in “8.8.8.8:10000”, “8.8.8.8” is public IP address, and “10000” is port. “8.8.8.8:10001” is another public address. Since 8.8.8.8 is a public address, it is no problem for SIP client to send its audio stream to this address. Then, both call sides can hear each other now. Can STUN resolve all one-way / no-way audio problem? No, it can work well in most scenarios, but it cannot resolve all problems. It depends on the private network type. Simplely, it depends on the routers ( of course, in some network, it can be firewall probably too). Please look at above figure. There are two sessions: one for request public address from STUN server. Another is call session between SIP phone and SIP client. As we know, the router will keep the mapping relationship between public network address and private network address. By default, most routers will assign and keep the same mapping for different sessions if they are from the same device in the private network. So the SIP phone will have the same public address in these two sessions. But some routers or networks will assign different mapping for different sessions, that means the sip phone will have different public address for these two sessions, so it still cannot know its public address of the session between it and SIP client. If STUN cannot resolve your one-way audio problem, the root reason could be the router or your network type, and the final perfect solution is establish a VPN network to include all your SIP phones and SIP clients. That’s another topic.